Bastiaansen Bio cheese is organic, vegetarian and sustainable. We only use the best ingredients: no food colourings, flavour enhancers, preservatives or other additives. 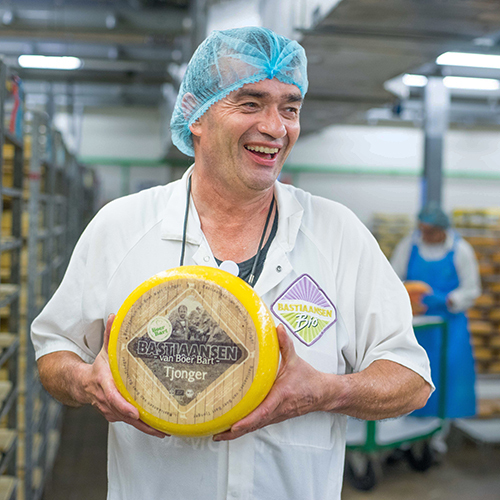 After production our cheese is given time to age, which allows its full flavour to develop. You can taste the difference! And that's what our customers like. Discover the favorites of our cheese makers, their craft and favorite recipe! Cheesemaker at Bastiaansen Bio in Molenschot, Noord-Brabant, The Netherlands. Here in Molenschot we mostly produce blue cheeses and red smear-ripened cheeses. This is something I’m really proud of because there are many factors involved, which means producing these special cheeses with a natural rind is not always easy. For a start, you’re dealing with a living product as well as variations between the batches of milk that you use. The process is always different, and it can be a challenge to use a variety of cultures and moulds to develop new kinds of cheese. Together with our colleagues in the sales departments we put these new, and above all tasty, products on the market. That is something I always look forward to! My favourite cheese is our ‘Authentique’. Developing a production process for blue rind cheese without risk of cross-contamination posed quite a challenge. This didn’t just mean adapting our production process, but also changing the way we work and the route the cheese took through our facilities. We even built a new ripening room. After much trial and error, we were eventually able to make the perfect blue cheese. The rind was the most difficult thing to get right; getting a good blue exterior requires excellent hygiene and precisely the right environment for the cheese to ripen. 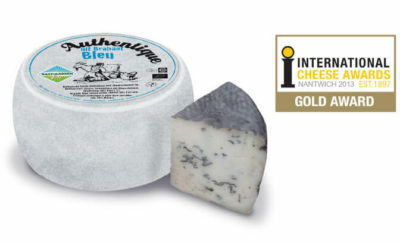 This gives the cheese its downy blue rind, soft and creamy interior and distinct blue veins. Cheese is in our blood. I grew up with cheese and I was only 6 when my dad made his first cheeses in our kitchen. He set the company up at home as a small-scale venture which was run with passion and craftsmanship. We never dreamed it would grow into the amazing company it is today. One of my favourite things to do as I work at Bastiaansen Bio is developing new products. New kinds of cheese and new flavours. I find my inspiration in my herb garden or at the market, where you’re met by the aromas of herbs piled high on the stalls. When I’m in the kitchen I like to try out new combinations of herbs and spices and that often results in new ideas. From then on, trying it out in cheese is only a small step. I really like a lot of the Bastiaansen Bio cheeses and they are often to be found on our table at mealtimes. But one of my favourite cheeses has to be Bastiaansen Bio Gold. When Jan Bastiaansen left the company to retire we wanted to pay tribute to him by doing something for him, something of lasting value. 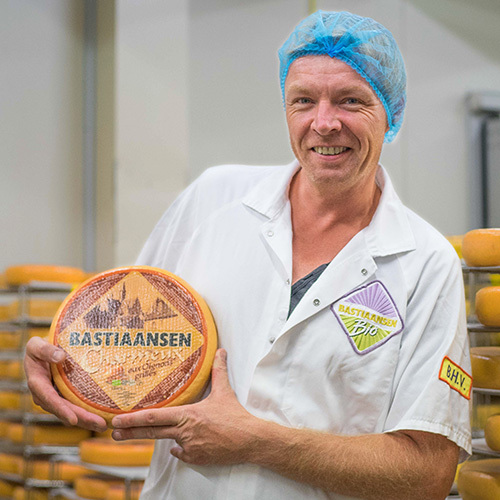 So we created a special cheese for him; Bastiaansen Gold, with his portrait on the label. Even now, years later, the cheese still displays his portrait. I love to cook international dishes and one of my favourites to put on the menu at home is Pita breads with a Moroccan-style spicy filling. The combination of fresh goats’ cheese with mature Dutch Gouda cheese really works. It takes no time to make and is the ideal recipe for busy people! Bastiaansen is a small, friendly company. I love working here. My passion is to work with my hands and to actually create a product. It gives me a lot of satisfaction to know that other people enjoy the cheeses we make. It is difficult to choose because I really enjoy eating all the Bastiaansen cheeses. But one of the many cheeses which are at the top of my list is definitely our brie made from cow’s milk. Adding a drop of cream to the milk makes it deliciously soft and creamy. If you ask me, it’s perfect. I really enjoy eating it with a good glass of white wine when I have time to relax in the evening. Because I always start work early in the morning I’ve got time to cook in the evening. This is a favourite recipe: creamy brie soup. After a hard day’s work this soup really keeps you going. 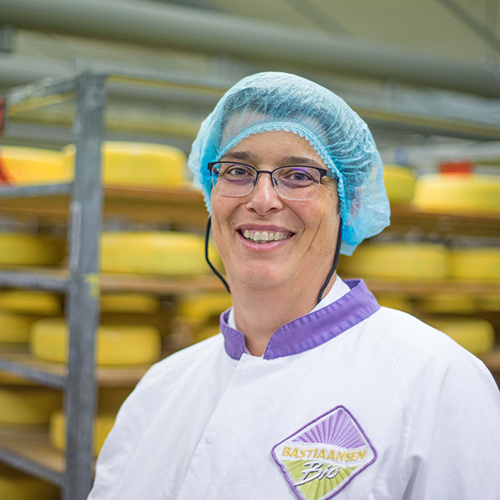 Every Bastiaansen cheese is privileged to be made with all care and craftsmanship. We do not compromise on quality and combine years of experience and craftsmanship with the most modern techniques. Our craft is recognized from all over the world into Dutch cosiness.